One summer's night, Abby lay in her bed. The window, wide open, allowed the cricket's chirp, the frog's croak and the gentle breeze to float into the room. She thought about her flowers. Earlier that day she and her mother had planted several different flowers and they were all Abby's to take care of. She climbed out of bed and stood at the window, looking out. The moon was bright and full and moonbeams shone down on the flowers. She saw a star. “Star light, star bright, first star I see tonight, I wish I may, I wish I might, have this wish I wish tonight.” She thought about what wish she wanted to have come true. “I wish my flowers could sing. Then I could go outside and lie on the grass and listen to them.” After she'd made her wish, she climbed back in bed and fell asleep. “They don't?” Abby took a bite. “No. Never. You have to keep your wish a secret and not share it with anyone.” Mom sat next to Abby. After she'd helped her mom wash the dishes, she ran out to her flower garden. She spoke to the colored petals. “Flowers, I made a wish last night. I wished that you would sing, so I could lie here in the grass and listen. Did my wish come true?” She lay on her back and looked up at the morning sun. “Abby, sweet girl, with big eyes of blue. 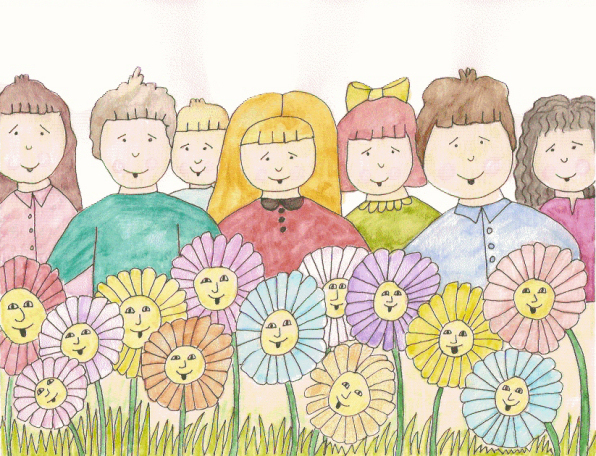 We flowers will happily sing songs for you. And when the wind blows, we nod our head. The flowers sang to her. She giggled and listened as they sang songs about frogs that wore hats and butterflies that wore shoes and how grasshoppers read the Sunday news. They sang songs of puppies and kittens and bears and fluffy white rabbits and gray long-eared hares. “What did you wish for, Mom?” Abby sat in the chair. Abby didn't know what to say. She couldn't believe her mom had wished for the same thing. “Okay, Mom. I'll keep it a secret.” Abby went up to her room and played with her toys. She thought about what her mom had said. More than anything she wanted to tell her friend, Ashley, about her wish, but now she knew she couldn't. Every morning for the rest of her life the flowers sang to her in the summer, while they bloomed. She kept planting more and more until she had a chorus of poppies, nasturtiums, daisies, roses, hollyhocks, carnations and geraniums. Even when she got married and had children of her own, she never told anyone her wish, even when they asked why she spent so much time in her garden. It was her wish, her secret, forever.